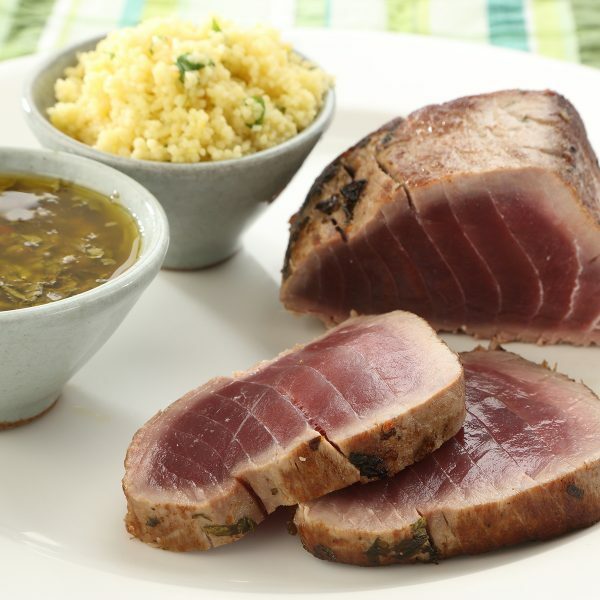 Seared tuna with Sicilian vinaigrette - home cooked food delivered. A mouthwatering fresh tuna loin, seared on the outside and a gorgeous purple-pink within. A wonderful Sicilian-style vinaigrette featuring capers, anchovies and mint serves to greatly enhance the flavour of the fish. The tuna can be served at room temperature, or roasted whole or in steaks if you prefer. Fresh tuna, capers, anchovies (FISH), garlic, dried chilli, mint, coriander, flat leaf parsley, red wine vinegar,, olive oil, seasoning. Remove from packaging and bring up to room temperature. This can be sliced thinly and served as is, drizzled with the vinaigrette. You may want to roast it whole or cut into steaks and cooked on a baking tray in a preheated oven. 10- 12 minutes will cook it medium rare or simply leave to cook longer if you prefer it cooked through more.